The Gift Planner has the most amazing chocolate safety cone construction gifts. They are the perfect Christmas holiday gift. Unique one-of-a-kind corporate themed gifts that stand out. Great for any contractor, construction worker or builder. Let us create you a branded gift using your logo and decorate in your corporate colors. At The Gift Planner, we take branding to new heights. You create your themed gift. Your choice of themed chocolate pieces. Ribbon and bow colors and edible decoration colors too. 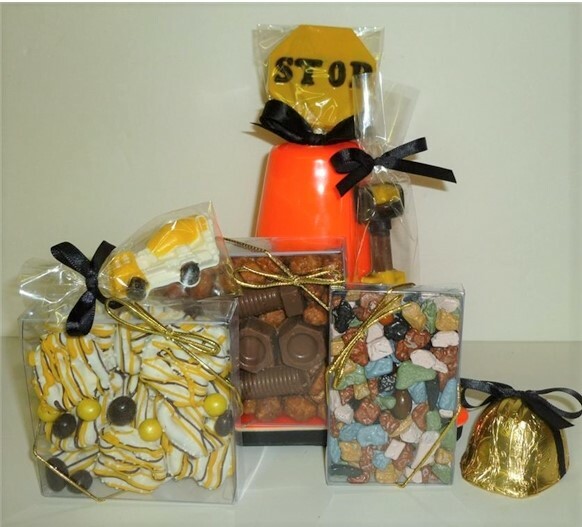 Brand New Chocolate Safety Cone Corporate Gift Basket Perfect For Client Christmas Gifts! Get in the zone with this delicious safety cone! The Chocolate Zone Construction Safety Cone can be customized using your logo and decorated in your corporate colors. Safety Cone measures 6 inch x 6 inch. This unique corporate gift includes a dipped pretzel box. A chocolate nuts and bolts box and rocks box. Foiled chocolate hard hat. Cement OR dump truck and chocolate shovel and stop sign. This adorable construction themed gift wrapped in caution ribbon will wow any recipient. Delicious and adorable gift basket makes a perfect holiday gift. Say thank you to your favorite clients. Various imprinting options that best highlight your logo and company! A wooden crate filled with a safety cone theme for any contractor or construction worker. 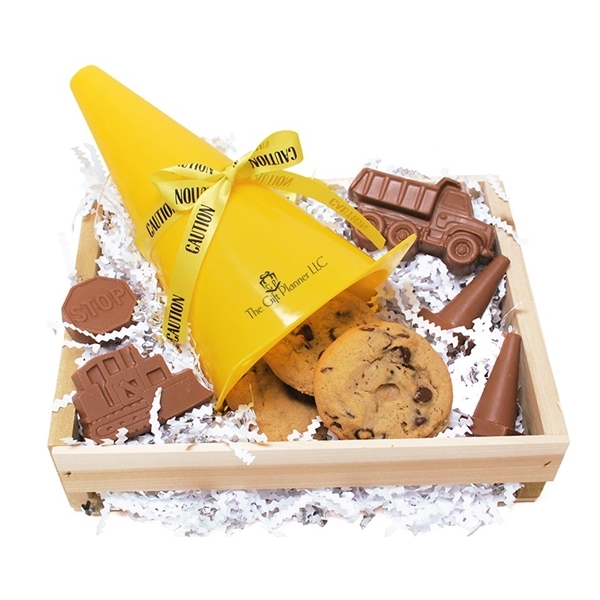 Create A Crate Chocolates And Cookie Safety Cone includes 5 pieces of chocolate construction tools and 6 soft and chewy chocolate chip cookies. The wooden crate measures 9 inches x 10 inches. A 10″ safety cone available in orange or yellow which can be imprinted with your logo. 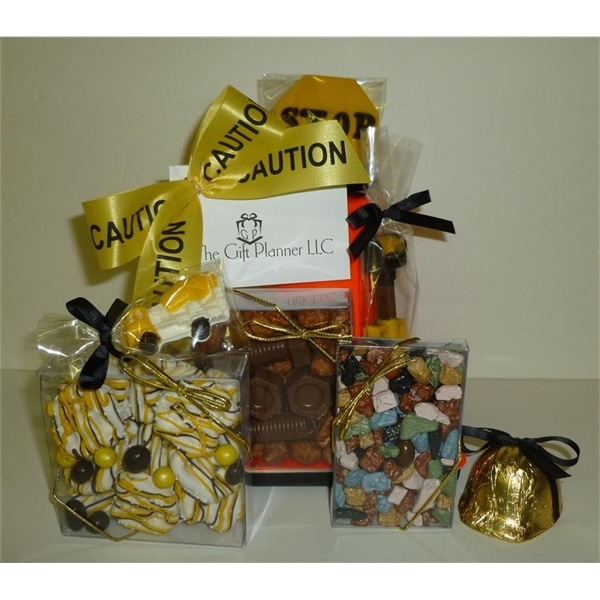 All tied together with yellow caution ribbon to give you the perfect construction themed corporate gift! Brand new in 2018. Ideal for Christmas holiday gifts, client gifts and thank you gifts! Create A Crate! The Gift Planner Offers Create Your Own Corporate Gift! The Choices are YOURS!